When a solid sample is sputtered by primary ions of few keV energy, a fraction of the particles emitted from the target is ionized. Secondary Ion Mass Spectrometry consists of analyzing these secondary ions with a mass spectrometer. Secondary ion emission by a solid surface under ion bombardment supplies information about the elemental, isotopic and molecular composition of its uppermost atomic layers. The secondary ion yields will vary greatly according to the chemical environment and the sputtering conditions (ion, energy, angle). This can add complexity to the quantitative aspect of the technique. SIMS is nevertheless recognized as the most sensitive elemental and isotopic surface analysis technique. The SIMS technique provides a unique combination of extremely high sensitivity for all elements from Hydrogen to Uranium and above (detection limit down to ppb level for many elements), high lateral resolution imaging (down to 40 nm), and a very low background that allows high dynamic range (more than 5 decades). This technique is "destructive" by its nature (sputtering of material). It can be applied to any type of solid material (insulators, semiconductors, metals) that can be kept under vacuum. While Static SIMS concentrates on the first top monolayer, providing mostly molecular characterization, in dynamic SIMS mode, bulk composition and in-depth distribution of trace elements are investigated with a depth resolution ranging from sub-nm to tens of nm. Dynamic SIMS instruments are equipped with Oxygen and Cesium primary ion beams in order to enhance, respectively, positive and negative secondary ion intensities. Starting from the surface (or going through an interface), while the primary ion dose implanted in the target increases, the primary species concentration (oxygen or cesium) will reach an equilibrium depending on the sputtering conditions and the nature of the target. This equilibirum corresponds to a sputtering steady state, and as soon as it is achieved, reliable quantification is possible with reference standard samples, using Relative Sensitivity Factors. One of the main applications of dynamic SIMS is the in-depth distribution analysis of trace elements (for example, dopants or contaminants in semiconductors). 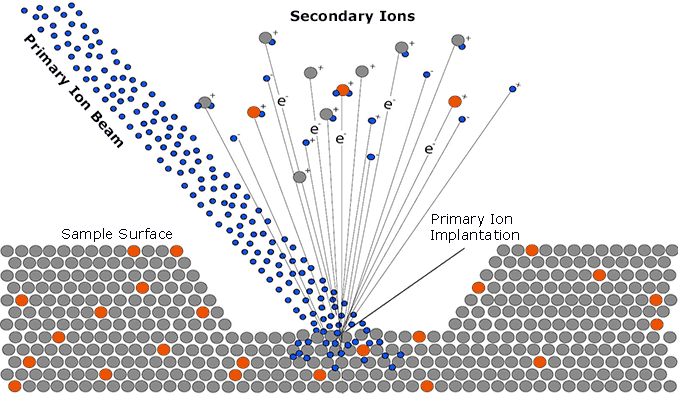 Ion impact energy is adjusted depending on the depth od interest and required depth resolution. Low energy (down to 150eV) is used to reduce atomic mixing due to the collision cascades and improve depth resolution down to the sub-nanometer level. High energy (up to 20 keV) is selected to investigate deeper (tens of microns), faster (sputter rate of µm per min range), and to improve detection limits. Dynamic SIMS is also frequently used for high resolution imaging analyses and high precision isotope ratio measurements. All CAMECA SIMS instruments are optimized for dynamic SIMS analysis. Since pionneering Secondary Ion Mass Spectrometry in the 1960's, CAMECA has developed a complete SIMS product line. Each of our high-end instruments ensures the best performance for a given application.